In the previous post I installed Debian 8 (jessie) into Thinkpad X260, but I actually changed my mind and re-installed Debian 9 (stretch), because it supports the wifi equipped in Thinkpad X260. A good thing is Debian 9 is already freezed so I can expect there're only a few critical bugs remained (well there're actually one to two hundreds of them as of today, but it's relatively a small number given that it has over 40K packages). One big difference between Debian 9 and 8 is the kernel versions they use (4.9 vs 3.16), and especially the support for Intel PEBS (Precise Event Based Sampling) is way better (or I have to say way more proper) in kernel 4.9. This post explains what PEBS is a bit and how its support gets better if you use kernel 4.9. PEBS is an extension of the performance counters, which is a mechanism to measure various hardware events such as number of cache misses, number of branch prediction misses, and many many others. If you're not familiar with the performance counters, please refer another site like this. For the explanation of each counter, you can refer section 19 of the volume 3 of the super thick manual from Intel. Note that the event number and the umask have to be specified to perf in the reversed order of how they appear in the manual. For example if you measure a counter whose event number is AA and the umask is BB, you have to do perf record -e rBBAA (not rAABB). Now you can see that no r20D1 occurs on any instructions without memory accesses. Another huge advantage of PEBS is it supports retrieving the register values, the instruction pointer, the memory address accessed, and the source of data at the time the instruction triggering the event occurs. However explaining these requires a whole new long post so I just leave it to another manual from Intel. The Linux kernel holds a list of counters that support PEBS, because not all counters support PEBS so the kernel has to know which ones are PEBS-capable. For Skylake and Kabylake, PEBS is supported for the counters which have "PS" or "PSDLA" in the comment column of the manual. For Broadwell or older CPUs the manual says "Supports PEBS" in the comment column for PEBS-capable counters. I don't explain what each INTEL_* macro means, but the point here is the kernel defines a counter rXXYY is PEBS-capable if there's a line like INTEL_SOMETHING_CONSTRAINT(0xXXYY, 0xf). You can see there are r01D1, r02D1, r04D1, and r40D1, but no r20D1, even though r20D1 is described to be PEBS-capable in Haswell in the intel manual. Note that Haswell was the latest core generation at the time of kernel 3.16 release, and for newer versions of CPUs such as Skylake the linux kernel just treats them as Haswell. 'precise' request may not be supported. Try removing 'p' modifier. This issue has been already fixed in kernel 4.9. Therefore Debian 9 that uses kernel 4.9 can properly handle r20D1 as PEBS-capable and it allows perf to measure r20D1:pp. This macro specifies that any counters ending with D1 are PEBS-capable. If you use special hadware functionalities such as PEBS, I do recommend to upgrade your distro and the kernel. PEBS has existed since Pentium 4, but the supported counters are ever growing and changing (actually r20D1 was the number of micro operations until Broadwell, but it was changed to the number of instructions since Skylake). So you'd better use a near-latest kernel as long as you can to get a proper support, and using the latest distro might be an easy way to go. This post aims to be a help for computer newbees, or those who are working in the application layer but somehow have to buy a new server and install Linux on it, but are confused by those complex naming of CPU architectures (i386, x86, IA64, ...). Note that this post shows which CPU "instruction set" architectures are compatible/different, but it does not step into how each "micro" architectures are different (e.g. Skylake vs Broadwell). If more than 1 name is shown in the "Arch Name" column, you can expect they are all the same. If you're interested in why a single instruction set architecture has several names, you can refer the next section. *1: Pentium and Celeron brandings are bit confusing. As the names were reused after 64 bit-ization, there are also 64 bit versions of Pentium and Celeron. *2: Althon is even worse because the original 32 bit version was "Athlon", then 64 bit versions named "Athlon 64" were released, after that AMD removed "64" from later 64 bit versions and they're named just new "Athlon" (like iPad -> iPad3 -> the new iPad). OK, so why a single instruction set architecture has many names? Here's the history. They originate from old Intel CPU series: 80386, 80486, 80586, 80686, etc. 80386 was the first 32 bit CPU from Intel, and the successive ones were named 80486, 80586, 80686, ..., so from some point they started to be called x86 (x can refer 3, 4, 5, 6, ...). The instruction set architecture used in 80386 was called i386 ("i" from "i"nstruction), but people refer the architecture (i386) and its implementations (x86) interchangably. i386 is also called IA32, meaning "I"ntel "A"rchitecture with "32" bit addressing. The reason why (relatively) recent CPUs such as Pentium 4 are also called x86, is that they are still backward compatible with 80386. This means that any instructions supported in 80386 are supported in Pentium 4, which does not necessarily mean any old programs written for old computers work in recent ones. For old software to run on newer machines, they require OS- or compiler- level ABI/API compatibilities. However the compatibilities (especially OS-level ones) are kept very carefully, because for computers to sell the most important thing is if they have lots of applications to go (that's one of the reasons IA64 could not become popular, that's why Windows phones never pop into your choices). They are extended versions of x86, which can handle 64 bit address spaces (meaning that they can utilize more memory natively) and have other advantages as well. In this meaning they are called x86_64, also x64 for short. A confusing point is x64 is newer than x86 although the number is smaller. You may go crazy if I tell you about x32, which is a concept newer than x64. It's like a mixture (combining good things) of 32 and 64 bit modes, but normally you still don't see it often now. Wait, but why didn't Intel name it IA64 instead of EM64T?? That's because at that time IA64 already existed, and it was a brand-new 64 bit architecture that had no compatibility with x86. Intel's first aim was to replace old x86 by IA64 (the actual implementation was named Itanium), but for many reasons it failed. What is really confusing, is after several years Intel gave a new name to EM64T, that is Intel 64! *3: There are a lot of differences in fact, especially in additional functionalities such as Intel VT or SSE, but that's not the topic of this post. 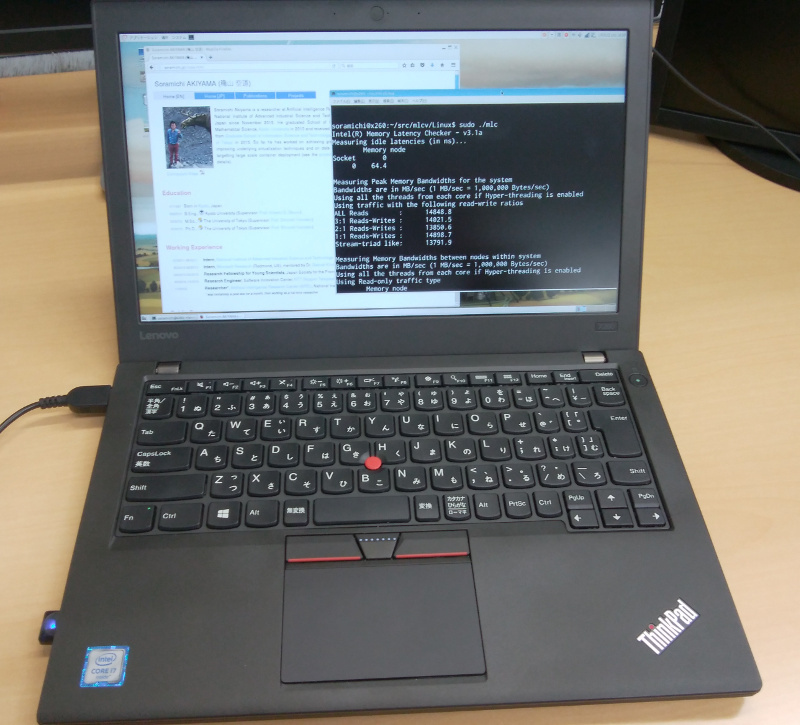 I got a thinkpad x260 and installed Debian GNU/Linux 8 (which I also use for my desktop and servers). Here are some tips for someone (or no one?) who wants to do the same. I basically followed normal operations. The point is to shrink C: using Windows tools and never let the Debian installer modify existing partitions. In this manner you can greatly reduce the possibility of committing a serious mistake. Create a recovery medium using one of the Windows official tools. Type "recovery" in the start menu and you'll find it. Delete the recovery partition using the "management tool" you can find in the "control panel". Be careful: by doing this you lose the way to create a recovery medium again. Make sure the one you just created works perfectly. Shrink the existing partition for C: with the same tool. Disable "security boot" functionality from the BIOS menu. Create a bootable USB of Debian and install it. Choose "guided partitioning" and "available free space" when selecting where to install. Never do partitioning manually unless you're really sure what you are doing. Unfortunately the wifi inside x260 (Intel Wireless 8260) does not work with the linux kernel included in Debian 8. I upgraded the kernel to the latest stable (4.9) but then X got some error and did not work (the same actually happens with my desktop so it might be a problem between X and the latest kernel). For those who want to use a self-built kernel, an official guide from Debian is the most easy-to-follow. Instead I just use WLI-UC-GNM2 from Buffalo that was sleeping in my desk. To make it work I had to add contrib and non-free repos to /etc/apt/sources.list and installed firmware-ralink package. After that it works perfectly with no command-line settings. It works with the maximum resolution (1920 x 1080). Have never tried the HDMI port though. The brightness control buttons in the keyboard do not work in the default setting (I use MATE as my desktop environment). They both work perfectly. Scrolling with two fingers on the touch pad also works. Speaker and mic both work. The volume control buttons in the keyboard also work. I think the weakest part of Thinkpad X260 is the memory bandwidth. This machine only has 1 memory slot thus only 1 memory channel is usable (although the CPU has two channels). If you wanna do some big-data stuff or machine learning, I recommend you to buy T or X1 series (or something from other vendors) that have at least two memory slots. As Intel Wireless 8260 is supported from kernel 4.1, it works with no hurdle with Debian 9 (Stretch, a.k.a testing, next stable). Note that you still have to install a non-free binary firmware (firmware-iwlwifi package from non-free repo). A drawback of installing the testing release (other than the fact security updates are not so often provided) might be the gcc version, which is 6.3 and can be too new for those who have ultra legacy codes written for gcc 3.x or even 2.x. When I was installing an anti-virus software into Windows 10 (not Linux), it seems like some of the input signals were dropped. Altough the load was extremely high for all components (CPU, mem IO, disk IO) at that time, this was I guess bit strange. What happened was during the installation the mouse cursor got extremely heavy, and it's not just delayed but some signals were definitely ignored, like a click of mouse was successful only with 75% of possibility. I don't know if it is due to the hardware or a bug of Windows 10. It might be the case that Windows ignore some signals on purpose??? (It's not related to Debian, but this is very first time for me to see such a phenomenon so I put it here). One thing true is this has never happened so far in Linux, even with a very high load for example a kernel re-compilation. Let the C compiler recognize two types different, even when the two are actually equivalent in terms of the size and contents. Wrap each type in a struct to add type information, as a compiler recognizes two structs (even with the same size) as different. The code above compiles with no relevant warnings. Actual definitions of A1 and A2 are not needed because creating a pointer to a struct does not require the actual definition of the struct (otherwise, recursive data structures such as linked list cannot be written). An disadvantage of this method compared to actually defining wrapper structs is since there are no definitions of A1 and A2 people reading the code can be confused (I actually was when analyzing QEMU's source code, and I learned this trick from one of the ML entries). This might be cleaner. The difference is that this version does not need never-used names of the structs, but instead it just defines empty structs. From the access logs it's obvious that the latex and pdf tips page (in Japanese) is one of the most popular contents besides my profile and seems like it's somewhat highly page-ranked by google, so I put here an English translation. It's useful especially when you submit a paper to an IEEE conference (whose latex style shows you how to equalize the heights with super troublesome way). Note that output is a command option, which you should put as-is. If you want to set the size of your PDF to US Letter (also referred as simply 'Letter' size) but you don't know how to tweak the style file, the paper option of dvipdfm (or dvipdfmx for CJK people) can help you. The avarge citations per article in ACM digital library. Note: the numbers may be biased due to the difference of main research area of each institution and many other factors, so comparing small differences like by several points can be irrelevant. Pinning processes to specific cpu cores (a.k.a. cpu affinity) is important both for performance analysis and improvement. However in Python, especially when you use high-level interfaces, it is tricky to do it because Python does not support cpu affinity directly. This post explains how to pin processes to specific cpu cores when you use multiprocessing.Pool. Note: this post is only for Linux, but not for OSX. I didn't even try it on a Mac as I don't have one, but I doubt it works because this kind of low-level OS interfaces differ much in Linux and OSX. On Linux (again I'm totally not sure if this applies to OSX as well), cpu affinity can be controlled with the taskset user-command. This command does not require the su previledge, as long as you control your own processes. A child process inherits the cpu affinity of the parent process. Thus if you don't need a fine-grained control, use this command once in the program and that's it. You might need finer controlling granularity, then you can read the following sections. If you create processes directly with Process(), it's super easy. Just use taskset for each process created by Process() one by one. If you use multiprocessing.Pool, you need some trick because Pool does not provide the way to get the PIDs of the worker processes (the reason is explained in the Appendix). To get the PIDs we get into the internal of multiprocessing. However it's way easier than cheating compiler based languages, as many libraries in Python are actually written in Python. Assume you use Python 3 from Anaconda, then multiprocessing.Pool is implemented in $anaconda/lib/python3.5/multiprocessing/pool.py, where $anaconda is the Anaconda installation directory in your env. Put the code blow around L187 of pool.py (right after self._task_handler_start()). Why does Process.Pool hide the PIDs of the workers? My guess is that to expose them to the user level is against the policy Pool takes (yes, it means this post is against it). Note: Worker processes within a Pool typically live for the complete duration of the Pool’s work queue. A frequent pattern found in other systems (such as Apache, mod_wsgi, etc) to free resources held by workers is to allow a worker within a pool to complete only a set amount of\ work before being exiting, being cleaned up and a new process spawned to replace the old one. The maxtasksperchild argument to the Pool exposes this ability to the end user. It means that the processes created by Pool transmigrate after completing a part of the assigned work for software rejuvenation. So if maxtasksperchild is set, PIDs of the worker processes are not constant throughout Pool.map() (or other functions to let worker processes work). In pool.py, this mechanism is implemented by a monitoring thread executing _handle_workers, which does _maintain_pool() every 0.1 seconds to keep the number of woker processes to the desired amount.